So much for the Valentine’s post I had planned. The pictures are somewhere and hopefully I will get around posting it this week. Though I may wait until April 14th, then I will be an even two months late. This St. Patrick’s day was ridiculous. I don’t know what came over me! I might as well have thrown all of my standards off the side of a cliff. First off, I finally made another tutorial I found on pinterest! 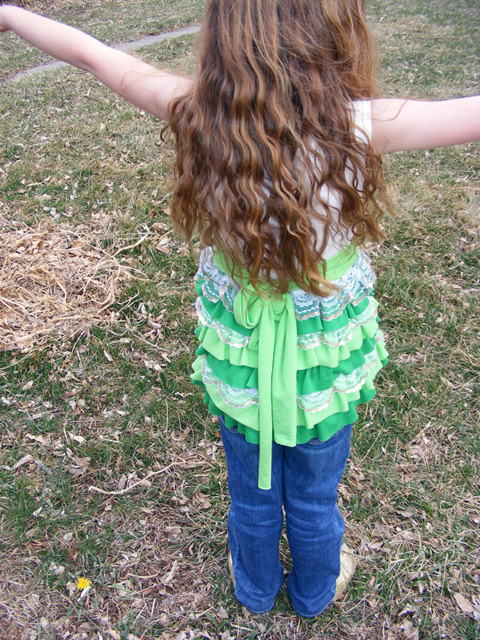 The instructions for the adorable little shirt we made came from The Life of a Cheap Chickadee. We obviously went for the greens and golds, being St. Patrick’s day and I only stayed up until 12:30am the night before finishing it. (This was mainly due to the fact that I refused to get up to start the project until after 10:30pm.) With that said, it is a great little project and perfect if you need a green shirt at the last-minute, since you daughter’s closet is stocked with every hue of pink, but not a speck of green. This is also a wonderful up-cycling project, if you have a shirt that is too short in the tummy or has spots on the lower parts. 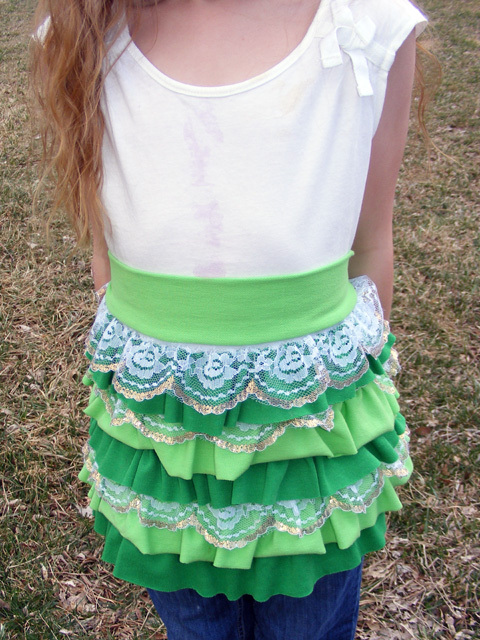 You can use old t-shirts to make the ruffles. Some tips I found out while sewing; cut the strips whatever width, but make them at least three times longer than the width of your shirt (I did this by just measuring across the front of the shirt three times with one of the strips, then cutting off the excess). Make a plan of where you want your tie band to be and then work up from the bottom to that point. Last, the shirt we used was very light and thin, it might have been better to use a slightly heavier jersey, that will better hold the weight of the ruffles. This year has been busy and the house looked nice, so I did not want a “visit” from any sort of “leprechaun” messing everything up. However, silly me, has done this in the past. Made a pile of books in the middles of the floor, spread shamrocks, dressed up stuffed animals, something to that effect. (Maybe it is something about St. Patrick’s day that causes my morals to slip). I had remembered doing it and the snug had too. While she wasn’t really wondering why the leprechaun hadn’t come, she definitely had a lot of questions and hypothesizes about it. Therefore, I felt a range of conflict (starting at my mom claiming that every child needs to have some sort of magic in their life – to – my dislike of creating implicit lies to my child [we don’t ‘do’ santa or the tooth fairy or the easter bunny, why would we do leprechauns]), so of course, my mom won out. I lied. I said that I had caught the leprechaun the night before, since I had been up late sewing. I had shooed him away since the house had looked nice and I was too tired to clean after him. (upon recollection, this wasn’t necessarily a lie). 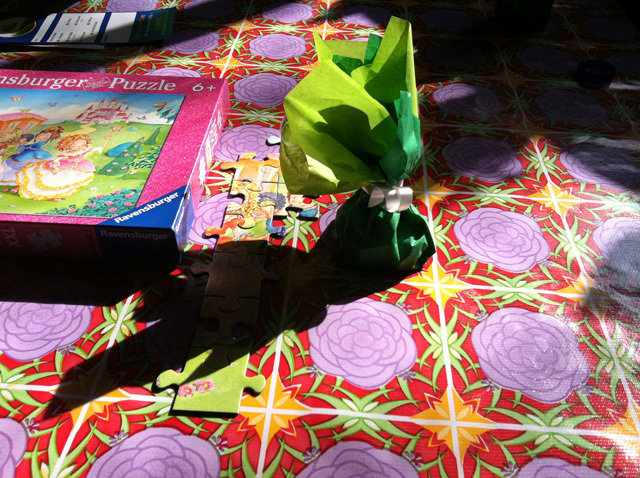 Later that day, I picked up a puzzle, put it together, and then took it apart in 10 piece chunks. I wrapped the chunks in tissue paper and hid them around the house. At least the cat enjoyed it. The snug did too, though she had voiced speculations. I am losing all of my moral standards. I lied to my child about a mischievous fantastical creature. I bought a gift for St. Patrick’s day, not a well known gift giving holiday. 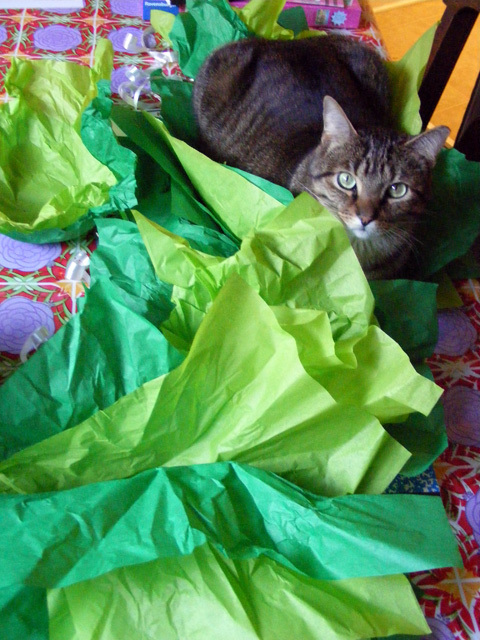 Then I wrapped it, in tissue paper, 2 for each package, that is 20 quarter sheets of tissue paper! What got into me?? P.S. While I talk about the shirt being a great candidate for up-cycling, ours was not. Not even close! The shirt we had bought long ago, but hadn’t worn. The jersey and lace we bought that weekend, since I didn’t have any green jersey. Or at least I didn’t have any that was readily accessible. Happy Week After St. Patrick’s Day! P.P.S. I don’t even have a category to put this wasteful account of a holiday in. Tsk, tsk. Oh well. Better luck next year. 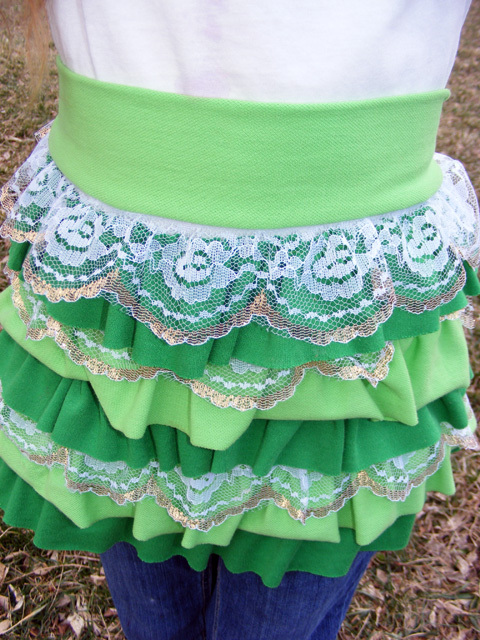 This entry was posted in Uncategorized and tagged clothes, holidays, ruffle shirt, sewing, St. Patrick's day, up-cycled. Bookmark the permalink.